Sometimes we are not restricted to Wedding Photography in Sheffield but are fortunate enough to visit some wonderful locations a little further afield. This wedding took place at the village church of St. Mary's in Lastingham, North Yorkshire. This was the Wedding of Kate and Matt with the village holding a special significance to them as it was here they got engaged. St. Mary's is an amazing and very old church with an intriguing crypt, the village is beautiful and nestles in some magnificent scenery of the North York Moors National Park. 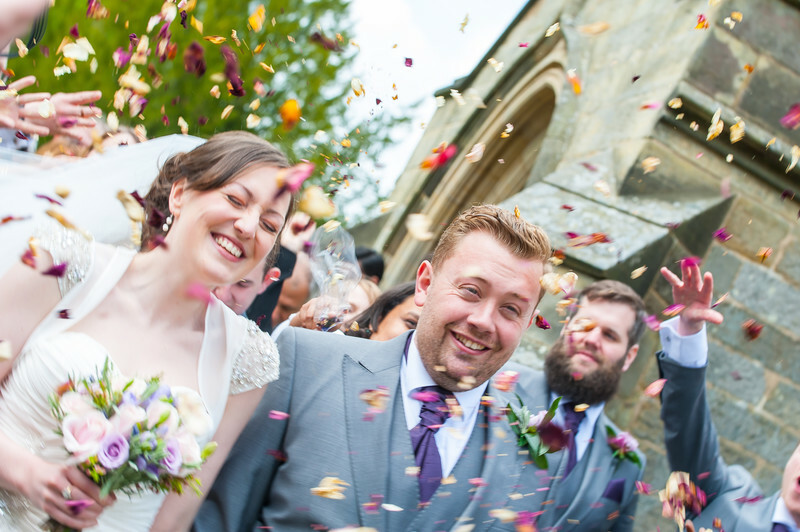 This must have been the most confetti ever thrown at a wedding, all rose petals - stunning colours! We feel incredibly lucky to have been asked to photograph this wedding in such a stunning for such a lovely couple at such an awesome location. Following the Wedding Service in the church and the photographs on the moors above the village we all returned to the Forest and Vale Hotel in nearby Pickering for the Wedding Breakfast, group photos in the grounds of the hotel and some serious partying! Limbo and giant Jenga were amongst the games on offer before the light finally faded and the disco got into full swing. A fantastic couple to be with as were their friends and family, this with almost perfect weather made it one of the highlights of the 2015 wedding season, who could ask for more?